Two things I learned at Collaborate 2012: 1) There are still a lot of JD Edwards users. 2) There are a lot of independent software companies selling reporting tools for Oracle's E-Business users. Some even let users use Excel for reporting. Remarkable. The other thing I was reminded of is the almost total disconnect the PeopleSoft user community has with what is supposed to the primary Oracle application gathering. Since PeopleSoft did not have its own "independent user group" when it was acquired and Edwards did, Quest - originally the JDE user group - was put in charge of all user meetings, where users could collaborate with each other and Oracle. Well, it turns out JDE and PeopleSoft users haven't found much to collaborate on, and while the Quest board probably tried their best to attract PeopleSoft customers, what they ended up doing is running a traditional JDE conference with tacked on PeopleSoft content. It hasn't worked. This year only about 260 PeopleSoft attendees came to a conference of over 4000 attendees (although anecdotal feedback was these few PeopleSoft users seemed very happy with the content provided). The Quest board is - oddly - elected by the Quest board. Since the Quest board was entirely made up of JDE users, the Quest board has continue to fill the board - six years down the road - with JDE customers. The one PeopleSoft customer (Hartford Steam Boiler, a CT insurance company) on the Board has finally persuaded Quest to have a focused PeopleSoft conference. He did this by "giving" the regular SNUG (Southern New England User Group) over to Quest for their new RECONNECT conference. (below). Quest did announce RECONNECT. a PeopleSoft only conference, and INFOCUS, a JDE only conference, to replace what has traditionally been two regional all-vendor programs in the fall. 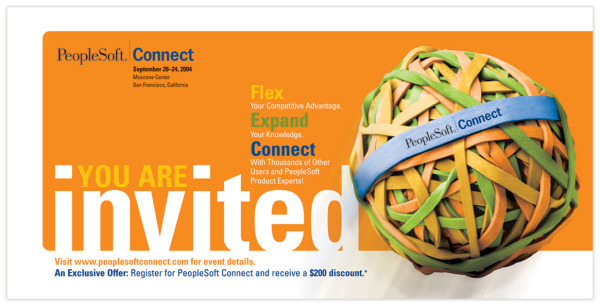 While a PeopleSoft only conference may be a start, I'm skeptical a meeting scheduled for Hartford, CT in August is the time and the place to try to get PeopleSoft customers to re-connect.